This is the theme of the last decade, it seems, and soon to be the theme of the next as well from the look of it. Not a bad thing really, in a society where commercialism and commerce is a huge influence, we as consumers go through a huge amount of waste every day. Being environmentally conscious is an important task in the view of the overwhelming amount of byproduct and waste our society produces as a whole. That's part of the reason (innovation being the other part) that I love today's feature shop. Half Pint Salvage is ran by Karl, a self-professed "reverse trash man" who has made the entire purpose of his shop to reuse, re-purpose and recycle items that he sees as having "simply been mistaken for something that's no longer usable". He rescues these items that have long ago been abandoned and gives them life once more and a new purpose in the world! Karl uses these items he finds to create unique, functional home decor pieces using salvaged and recycled finds and his shop is filled with terrific and innovative pieces that really show off his creative streak. 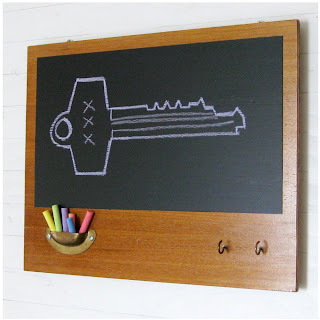 I'm especially fond of the chalk board pictured in today's post, in fact if I could find a place to put it in my home, it'd already be mine! So if you like to put an effort into saving the environment when you're looking for your home decor or gifts to give, be sure to stop by Half Pint Salvage and take a look. You might just find exactly what you're looking for, or something that you weren't looking for but now that you've found it you just can't do without! YOU CAN CLICK ON THE PICTURE ABOVE TO VISIT HALFPINTSALVAGE'S SHOP AND TAKE A LOOK AROUND OR, IF YOU PREFER, CLICK RIGHT HERE. I love recycled, repurposed items. Half Pint has a great shop. Thanks for sharing. I'm so happy about this new movement! I love your blog, by the way. This is one of my fave blogs! I love the 3Rs (recycle, reduce, reuse). It's something we should all work on to protect our planet - so important. i cant stress enough how much more i love art that is recycled. gosh ! 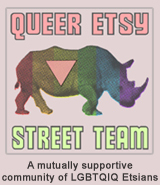 you have an amazing blog, i found you in etsy ant now im off to read every post !